Barros 20 Year Old Tawny Port - Delicate orange in colour, with a greenish rim. On the nose it is a rich and complex combination of dried fruits, spices and subtle hints of wood. Barros Colheita Port 2005 - Bright brown colour with reddish hints. Complex nose, characterised by the presence of the wood notes wonderfully blended with aromas of spice, dried fruits and delicate hints of fruit jam. Barros LBV Port - Ruby in colour. On the nose there are dark ripe fruit notes, reminiscent of plum, figs and blackcurrants. Barros Special Reserve Port NV - Vibrant ruby colour with violet nuances. Presents a complex and sweet bouquet of red fruits. Barros Vintage Port 1996 - Vibrant ruby colour with hints of brick. Conspicuous aromas of rich and sweet fruit on the nose with suggestions of plum and strawberry. Barros White Port - Lively citrine colour this White Port shows an engaging, delicate and perfumed nose, which is dominated by fresh, floral aromas. Ferreira Dona Antonia 10yo Tawny Port - The nose is characterised by an excellent balance between the floral and ripe fruit aromas of the grapes themselves and the spicy, dry fruit aromas of long ageing in barrel. Ferreira Dona Antonia 20yo Tawny Port - An intense bouquet showing the character of well balanced maturing through oxidation: dry fruits, spices and a hint of ripe fruit and marmalade. Ferreira Late Bottled Vintage Port - The intense aroma is dominated by very ripe black fruit (blackcurrant, blackberry and prune), along with chocolate, cocoa, floral aromas and a slight hint of spices (pepper). Ferreira Tawny Port - A fresh, delicate aroma, reminiscent of spices and dried fruit, reflecting the oak ageing. Krohn Ambassador Ruby - Rich and full Ruby Port, with smooth, soft finish. This port is mature and versatile with a deep red colour and a concentration of fresh, plummy fruit aromas plus hints of spice. Krohn Colheita 1996 - An excellent single vintage tawny port. Krohn Colheita 2007 - A beautifully balanced and seductive wine, at the perfect point of maturity. Krohn Lagrima White Port - Beautifully complex white port, and a great example of this style. Krohn LBV Port - LBV Port with bags of flavour and length on the finish from an eminently reliable Port house. Krohn Vintage 2016 - The keynotes of 2016 are purity and refinement. The Vintage Port displays elegance and poise, a wonderful purity of fruit and tannins of great quality. 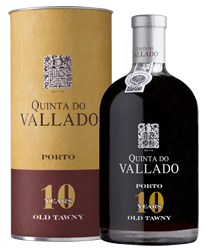 Quinta do Vallado 10 Year Old Tawny 50cl - This has rich nutty, dried fruit aromas and luscious, sweet raisin, mocha chocolate, spice and date flavours on the palate. Quinta do Vallado 20 yr Tawny Port NV - Very rich, combining dry fruit and cigar notes. Quinta do Vallado LBV Port- This Late Bottled Vintage shows brooding black cherry fruit with a huge cedary core. A simple wine with a fine dark colour, ripe and mouth filling, with a sweet finish.